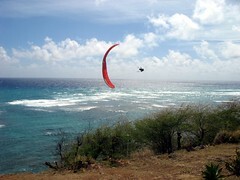 Yesterday afternoon brought us perfect conditions at Diamond Head. Light enough that we had to work the lift to get up from the roadside cliff, but once we were up we could fly anywhere on the ridge we wanted. On the other hand, today was the strongest day I've ever flown there - Pete was kind enough to loan me an extra small wing for the purpose. And the clouds were very striking today. Lots of folks came out to enjoy flying or spectating, both the usual Diamond Head denizens and some newer faces: over the course of the last two days there I saw Dave, Jetflap, Frank, Jorge, McStalker, Navy Don, Scot, Bob, Chandler from Arizona, Reaper and his roofing boys, Scrappy, Quentin, Sandy, and of course Kui. Also, Russell launched for his first flight there ever! Diamond Head has really changed as a flying site over the last few years. The old walkway launch at Kuilei Cliffs Beach Park was once a world-class place to launch and top-land, but ever since the city tried to landscape it we have watched it turn into an overgrown jungle. The garden launch is adequate to get into the air but it's a lot more challenging, and landing there is more of a stunt than a practical option. I guess we're all becoming a lot more familiar with the beach down there, as well as the variety of trails leading back up. cool pics! you should send them to ushpa!!! Weird - I don't remember being there :) I wish I was (at least for Thursday). Great pics as usual, Alex. Odd, I stopped by early afternoon and saw no pilots and almost no-body at DH roadside. Anyway a comment on the garden - I think it is primarily driven by a bandito gardener or two, and was only reluctantly consented to by the city. Furthermore, it's possible that the banditos could be swayed to keep their ambitions more launch friendly. I could have this wrong, but was present at a neighborhood "vision" meeting about 5 years ago when the city was told there was unapproved tapping of water lines there for irrigation as well as plantings, and would they please give it official blessing. It seemed like the city had little interest and would just not stand in the way of the activist gardeners. Furthermore I think I remember getting a sense of the (2 youngish male?) gardeners as being a reasonable and well meaning types who might want to accomodate uses like PG if they only know what the needs were. So a possible project for a smoother talker than me (I may have a list of names of people who know of the original banditos). 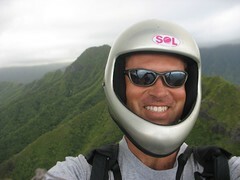 That was a good time at DH, even if I didn't get to fly(no glider). My guys loved it. I'm pretty sure I can get Doug to take the leap now. Before yesterday, he wouldn't even consider flying. I was hoping today would be good so I could in a flight or two? Two words for the illegal garden "Round-up"
Launch Spud and Reaper, I personally love that garden and I appreciate the shade of the trees and the nice grass on top for sitting on and for folding up after flying. If we wanted to consider a way to improve that garden area, maybe we could bring some astroturf or carpeting to cover the sharp coral sections. But even better than that would be to convince the city to let us do our own bandito gardening on the other side (the overgrown Kuilei Cliffs park), which is a far better launch and LZ in all directions. Do we fly there often enough to spend that much time and energy? I would think all it would take is one motivated pilot who lives relatively near there to spearhead this as a club project. Just close your eyes and imagine that overgrown mess as a launchable golf course like Torrey Pines. So what if it's only flyable there twice a year! Launch Potato, I don't know when you were there exactly but you may have stopped by right between the morning session and the afternoon one. I got there around 2 pm for the afternoon session, and I left just after 5 with folks still in the air. Alex: That is right Maddog does live nearby. As far as the motivation thing, he pretty much spends his time flying around on his little red "scooter".